Jesus came from Nazareth, Galilee, and was baptized in the Jordan by John. Then Jesus was guided into the wilderness by the spirit to be put to the test by the devil. Then the devil leaves him, and heavenly messengers arrive out of nowhere and look after him. Do you renounce evil and its power in the world? We don’t often get asked that question. Nor do we often ask it of ourselves or others. But today we ask it. We ask it formally and liturgically. We ask it as we are celebrating new members joining our congregation by affirmation and reaffirmation of faith and by baptism. doesn’t sound very polite. It doesn’t sound even “progressive.” We don’t talk about sin and evil anymore do we? Haven’t we left that language behind? Only the Bible thumpers talk like that, right? That is a good phrase: conscientious resistance to evil. Yesterday, six people were killed and twelve injured by a gunman in Arizona. One of the injured is congresswoman Gabrielle Giffords. She is believed to be the target of the attack. This is evil. But we need to say more. What is this evil specifically? What exactly is the locus of the evil? Is it the 22 year old who fired the shots? Is it something within him, some mental illness that wasn’t treated? Is it some "demon" within not exorcised? Is it our collective lack of care for our youth and for each other? Is it our messed up priorities? Is it our abuse of creation, each other, and ourselves? Is it the atmosphere of our nation and world? Is it the angst about future? Is it the fear and paranoia and our love affair with weapons of all kinds? Is it in our inability to communicate, cooperate, and create together? Is it our need to separate us vs. them, good vs. evil, blue vs. red, either you or me? Is it the nastiness of our political discourse exemplified by a politician who creates a map with gun sites targeting her opponents? Is this evil a form of terrorism in an attempt to keep people fearful and silent? And yet that same book also said that humankind is created in the image of God. It is confusing. It is complex. The answer to that question is, “Yes, I do.” And the answer needs to be, “Yes, I do.” And we need to say it clearly and with conviction and with humility. We need to say it even when we don’t know the extent of it or have a precise plan of how to renounce it. Not only do we need to say it, but we need to do it. For those of us in the Jesus tradition, our model of resisting evil is Jesus of Nazareth. 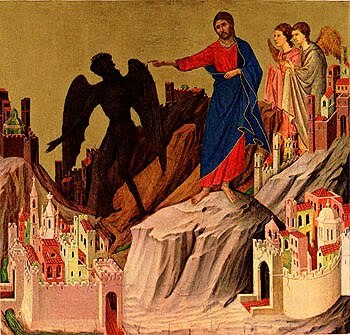 After his baptism, the text says he was led by spirit into the wilderness to be confronted by the adversary, the satan. In Hebrew mythology the satan functioned as the prosecuting attorney in the heavenly court. He is the official tester. This is the same character who tested Job. The fact that spirit leads Jesus to the wilderness shows that this is a test of his integrity. This is something he needs to go through. It is part of his spiritual path. Will he have what it takes to resist evil? This is of course a legendary story, yet even historical Jesus scholar, Bob Funk of the Jesus Seminar felt compelled to include the temptation scene in his book, The Gospel of Jesus. He thought this scene went back in some sense to the historical person. He thought that Jesus probably did go on some sort of vision quest, a time of fasting and self-purifying, to discover who he was and what kind of business he was to do. It is a story of integrity. The story is powerful and true. It is a story of renunciation of evil. On one hand, the three things that Jesus renounces don’t really seem that evil. Turn a stone into bread, test to see if God will keep promises by jumping off a building, show allegiance to something other than God, well…those are things that don’t seem that large on the evil-meter. There is a sense in which we all do them. Turn a stone into bread. The assumption here is that not everyone can do that. But Jesus can. The temptation here is for Jesus to use his privilege for his own benefit. We know how this can become evil. History and current headlines are replete with powerful, privileged individuals and groups securing “bread” for themselves. Maybe it is not wise for us to turn all stones into bread, all mountains into coal, and all forests into lumber. Just because we can doesn’t mean we should. Resisting evil is resisting the temptation to use power and privilege for our gain at the expense of others and perhaps in our time at the expense of nature. Jesus could do it, but refused to do it. Humans do not live by bread alone. There is something more important at work, namely integrity. Jump off a building. This is the temptation to view oneself as exceptional. We are chosen by God. We are special. We are good and moral. Other nations and other empires may do bad things. But not us. We are favored. When we invade another country it is for their own good. This is the temptation to self-deception. This is the congressperson who says we don’t need to worry about climate change because the Bible says that God won’t destroy Earth. Great evil is done by people who think they are somehow above law, either nature’s law or human law. Jesus won’t buy it. “Don’t put God to the test,” he tells the tempter. We renounce evil when we renounce the temptation to see ourselves as exceptional. We are human no more no less than anyone else. Jesus said no. Worship God alone. That meant I think that there is no ideal, no rationalization that is more important than justice, compassion, and right relation of humanity and Earth. ignoring that we are each others’ keeper. When we ignore all of these things the first thing to go is non-violence. Violence is the fruit of ignoring our call to be human beings. Jesus' baptism and testing in the wilderness is a model for our own personal integrity. It is recognizing that as we see evil out there it is also within. Jesus renounced evil by being creative. Against evil and its power, Jesus used words. He used his artistry as a wordsmith as a teller of parables as a teacher of compassion and justice. Jesus was no guilt-ridden wimpy liberal. He called evil by name and he called people out. He did the inner work to discover his own integrity but then he went to work and he named evil in high places. He spoke truth to power. He renounced evil and its power in the world. We can do likewise. We can and need to point it out. In a tense atmosphere in which unstable people have access to guns, when a nationally known political figure creates a map with rifle target sites on her political opponents like Gabrielle Giffords, that is just not cool. We need creativity, not just anger and frustration. It is the artist within who will save our souls. It is the musician and the poet within who will soothe and disarm the savage beast. It is the dancer within who will teach us new steps. In response to this tragedy and to this evil and to the evil of violence, we will tap in to resources within. We will discover creativity and direct it toward compassion. Right now, there are vigils, there are facebook pages, there are sermons preached, there are prayers spoken, there are people uniting to share their grief, to offer love and compassion, and to imagine a more peaceful, just, and kind world. We are created in the image of goodness, love, and blessing. That is who we are at our core. We are in turn creative and we have goodness, love, blessing and healing to share. Evil is a distortion. It is powerful but not ultimately so. More powerful is love, joy, and compassion. That is how we will renounce evil and its power in the world. Thanks for posting this, Rev. Shuck -- I really needed to read this right now! I'm forwarding this to a few friends --- thanks so much for your thoughtful words. Wise words and good thoughts. As I listened to you yesterday morning, the sting of the recent tragedy lifted a bit, just a little bit. Your sermon was at least in part healing for many of us in attendance and for those who read it here first. Thank you, and yes I do. Excellent. I accept the pledge.